By Meatloaf standards, it wasn’t a good night. 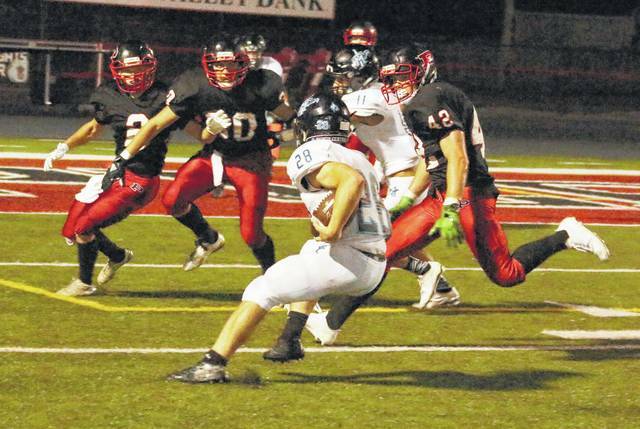 Point Pleasant was the only Mason County high school football team out of the three to come away victorious Friday night as both Wahama and Hannan suffered setbacks in Week 3 contests. The Big Blacks improved to 2-1 after picking up their 19th straight regular season road victory following a 54-7 drubbing of Warren (OH). PPHS led only 14-7 early into the second quarter, but the guests reeled off 26 consecutive second quarter points en route to building a 40-7 halftime advantage. The Big Blacks — who surrendered only 151 yards of total offense — went on to score a touchdown in each of the final two frames while wrapping up the 47-point triumph. The White Falcons — who trailed 21-7 at halftime — held host Southern scoreless in the second half while scoring two touchdowns themselves, forcing a 21-all tie at the end of regulation. Wahama, however, surrendered a two-yard touchdown run to Riley Roush in the second overtime, which allowed the Tornadoes to claim a 27-21 overtime victory. Hannan scored its first points of the season, but the Wildcats ultimately dropped a 42-6 decision to visiting Manchester. Both Wahama and Hannan are still winless through three weeks of play. Due to an early deadline, the Mason County football openers from Week 3 will be available in full detail in the Tuesday sports edition of the Point Pleasant Register. Game stories will be available online at mydailyregister.com before appearing in print. Point Pleasant defenders Josh Wamsley (2), Alec Smith (30) and Tucker Mayes (42) track down a Mingo Central ball carrier during the second half of a Week 1 football contest at OVB Field in Point Pleasant, W.Va.